Super Bowl LIII is racing toward us, and the NFL 2018-2019 season is almost ready to crown a new champion! SiriusXM Music for Business is here to get your business in the Super Bowl spirit leading up to game day. 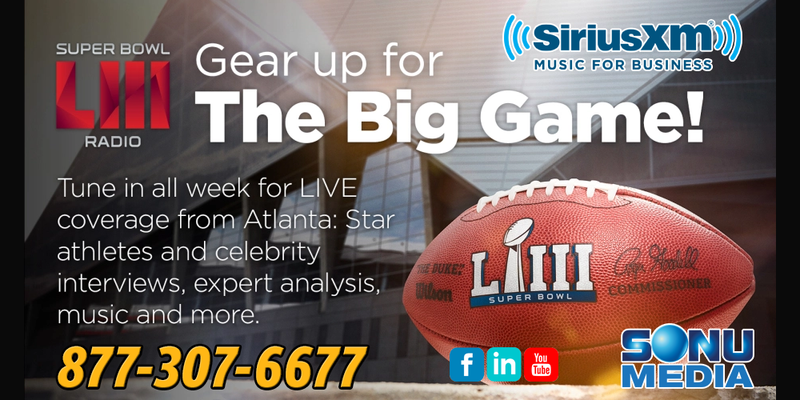 SiriusXM will launch Super Bowl LIII Radio from January 28th through February 3rd, and give NFL football fans an immersive audio experience, covering multiple aspects of Super Bowl Week 2019. Super Bowl LIII Radio (Channel 4) will air highlights from SiriusXM residential account channels also providing special broadcast events. This is in addition to the exclusive commentary, analysis, interviews, and other specials provided by Super Bowl LIII Radio. SiriusXM personalities, entertainment celebrities, and sports stars are stopping by to weigh-in on their Super Bowl 2019 predictions. The channel will also serve as an informational source on live events and logistics from Atlanta, GA. Updates will be continuously broadcast on Gameday Fan Plaza, transportation, parking, stadium security, and much more. Tune-in at your business and celebrate NFL Football with your staff and patrons. Not a SiriusXM Music for Business account holder yet? Contact Sonu Media for an exclusive introductory offer on 100+ licensed popular music channels for both your commercial properties and phone systems. Click the button below to request a free quote.